Even the best quality replacement windows can underperform from time to time. Window warranties can be a bit of a mystery to homeowners, and it can be very frustrating when a warranty does not cover a certain aspect of your replacement windows. It’s important to ask questions about your window warranty before committing to your replacement window purchase, this can help you avoid unwanted surprises when an issue needs to be addressed. The truth is, not all window warranties are created equal. Window warranties can vary from manufacturer to manufacturer, which can be incredibly confusing for homeowners. Not only that, window warranty terminologies can vary between manufacturers as well, leading to even further confusion. To cut through the differences and deviations, we’ve compiled a brief guide to help you better understand window warranties. Limited Lifetime Warranties are one of the most common warranties offered by replacement window companies. Often provided by their manufacturers, a Limited Lifetime Warranty covers defects in regard to the aesthetics and performance of your window. It’s important to know that a Limited Lifetime Warranty may only apply to the parts that need to be replaced and will not necessarily include the labor required to fix the window. This means that the manufacturer will foot the bill for any replacement parts, such as a new sash, for example. You may have to pay to have the manufacturer physically fix the window. This procedure varies between replacement window manufacturers. Make sure to ask your sales representative for more information. What Does Lifetime Mean for Window Warranties? One of the biggest misconceptions of window warranties is the term lifetime. In the world of replacement windows (and a variety of other industries as well), lifetime does not always mean lifetime. It’s simply the length of time (lifespan) the manufacturer determines the window will hold its quality. For example, very low budget windows can come with a Limited Lifetime warranty, but the warranty is only good for 3-5 years. Higher quality windows can be warrantied for as many as 15 years or more, depending on the manufacturer. What is Typically Warrantied in my Windows? Window Materials - Due to the cost between vinyl and wood windows, you might find a difference in coverage with your warranty. Window materials are often guaranteed to last a specific amount of time (e.g. 10 years) without deteriorating or showing signs of wear and tear. If the window materials become damaged inside of the time period, it is often covered under warranty. One example of window material coverage is vinyl extrusions in the window frame. Defects - Including inconsistent color characteristics are often covered under warranty. Hardware - Malfunctioning or broken hardware within the designated timeframe is often repaired or replaced under the warranty. Energy Efficient Glass Options - Inert gases are designed to last many years inside of the windows. Argon and krypton gas will both naturally leak from the glass at a rate of 1% or less per year. However, if the gas depletes at a much faster rate, this may be covered under warranty. Obstruction of Vision (Films) - Sometimes obstruction of vision can occur that is caused by dust or moisture in the dead air space. If this obstruction of vision occurs, contact your manufacturer to inquire about replacement or repair. Installation - When professional installation is provided, contractor error may be covered under warranty. However, keep in mind that attempting to install replacement windows on your own can void your warranty. Custom Options - If your windows include upgrades such as custom glass designs, etched glass, or grids, defects in these products can be covered under warranty. Glass Breakage - Some window warranties will cover accidental glass breakage up to a certain monetary amount. While good window warranties will cover many aspects of new window replacement, there are times when you will discover exclusions and even loopholes that reduce your actual coverage. 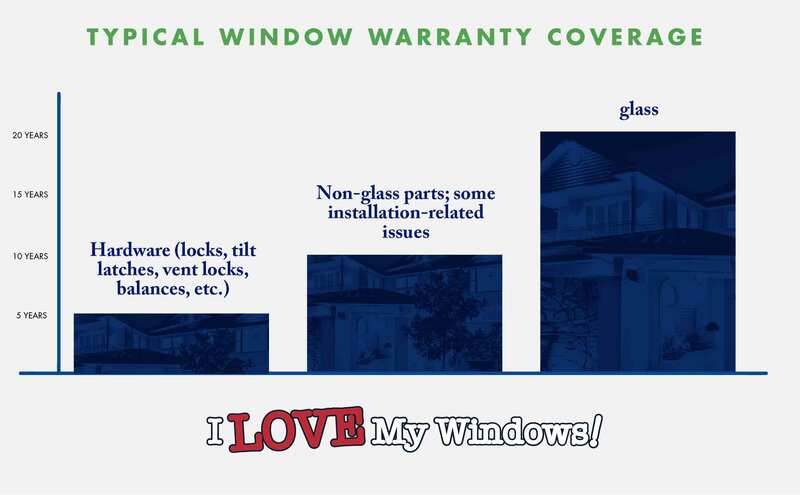 In most cases, any warranty is better than no window warranty at all. Unfortunately, though, there is often a list of exclusions that comes along with your new windows. You may also discover at some point that there are loopholes through which a window manufacturer may not cover items listed under certain circumstances. One such example of a loophole is not covering your windows if your home is located within a 5-mile radius of a body of water! An example of an exclusion is when the warranty does not cover tempered glass. Tempered glass can suddenly explode or break without prompting, which is viewed as too much of a risk to some window manufacturers. Therefore, you should always check your warranty for its coverage options. We try to make our window warranty as crystal clear as possible. However, no matter what window company you work with, questions will often arise with your coverage. This is expected! In fact, you should ask questions about your warranty---but what questions should you ask in the first place? How Long is the Warranty Coverage (in effect)? There’s nothing worse than needing to use a warranty and you realize it expired. This is why it’s important to get the details ironed out before signing on the dotted line. A few common warranty lengths include 5, 10, 15, and 20 years. In some cases, such as our True Lifetime Warranty, the product is covered for as long as you own your home! The length of your warranty will also depend on the product type. For example, a warranty for glass and a warranty for roofing materials will typically be different. If you are installing multiple products, such as roofing and windows, be sure to clarify this and understand the exact coverage time for each product. Does My Warranty Cover Installation? We’ve said many times that professional installation is critical for performance with your new products. However, some window warranties do not cover their contractor’s installation. You’ll find definable terms on what is covered in terms of window installation. An example of this would include coverage of installation issues for up to a 10-year period. Many homeowners are under the impression that when a product is covered by a warranty that it’s 100% free to fix. This is not always the case. It is not unheard of for the homeowner to pay a service fee--usually nominal---to have certain products replaced or repaired. Keep in mind that if you do end up paying a service fee, this is often much cheaper than starting the project from scratch or paying for it 100% out of pocket. Also, not all service inquiries require a fee! Does My Warranty Apply if I install my Own Products? Another helpful question is asking about warranty coverage when you choose to install the products on your own. While some warranties will still honor their coverage for self-installation, many will not. This is one of the major downsides of choosing to install exterior remodeling products on your own. If you think you may potentially move before your warranty expires, ask about the transfer of warranty. This can add extra value to the next homeownerwhile providing peace of mind! At this point, you might be wondering what exactly does a good window warranty look like, anyway? We are using our own True Lifetime warranty to outline the details! Pieces, parts, and materials. One example is if one of the internal operating mechanisms of the window breaks, which is replaceable under warranty. Glass systems and frames. Vinyl windows are moisture resistant and won’t rot from moisture damage. If the frames somehow become damaged, there are several instances where this is coverable under your warranty. All locks and hardware. Hardware and locks that may break or become damaged are coverable under warranty. All installation and labor. Errors caused by installation and labor is covered under warranty. 100% non-pro-rated. All of the above is covered for as long as you own the home! 100% transferable to a subsequent homeowner for a period of up to 30 years. This is a shining example of one of the best window warranties in the industry! It’s brought countless homeowners peace of mind with window installation along with our other products. 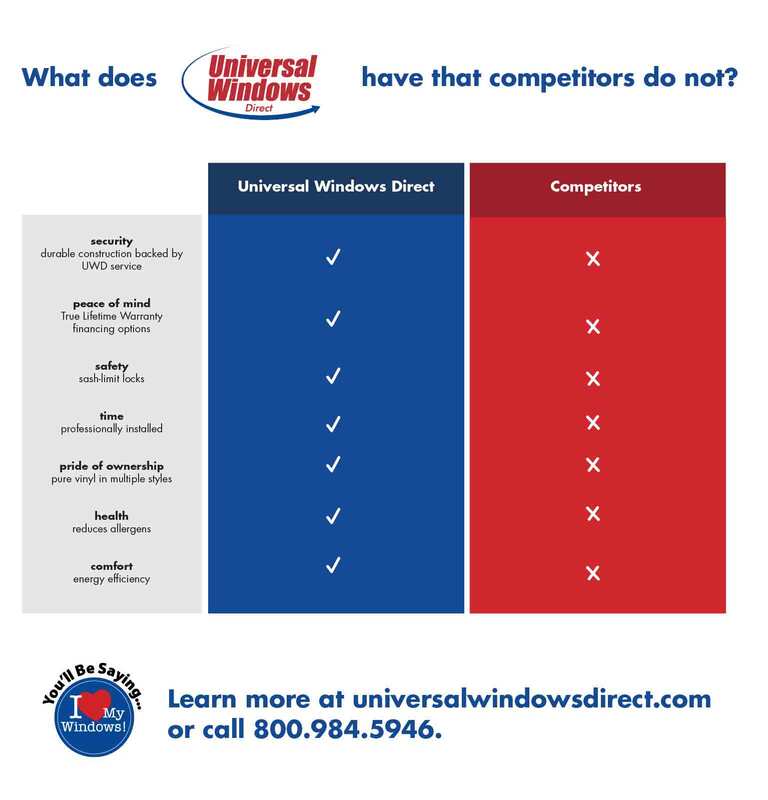 Universal Windows Direct will give each customer a pamphlet that overviews our True Lifetime Warranty coverage. Our extensive coverage will keep your windows performing at their top condition for years to come. To learn more about window warranties or to ask questions, get in touch with us today via our web contact form or call (855) 395-9377. 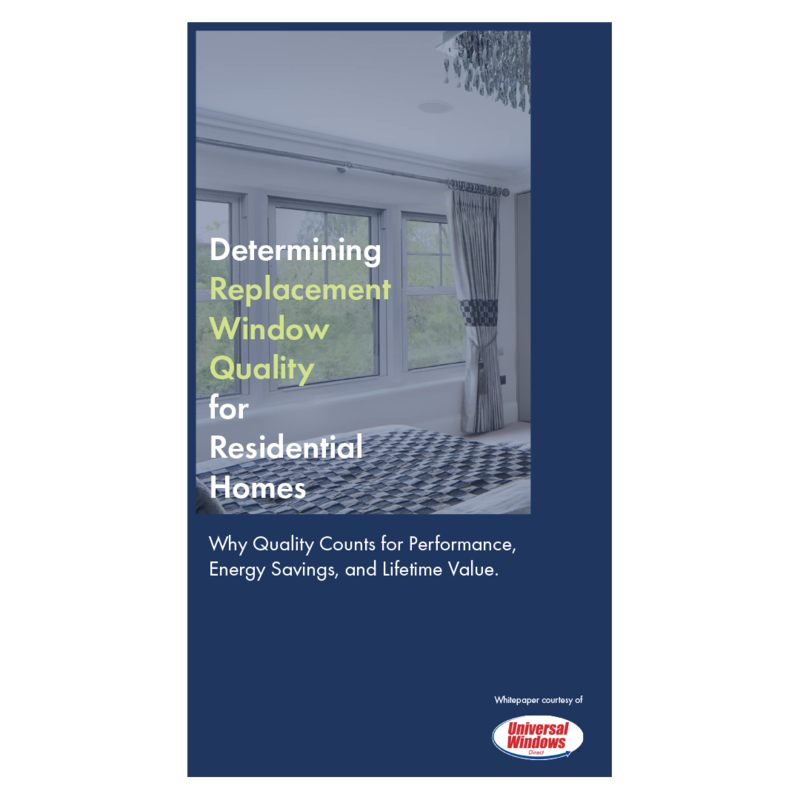 Get the inside scope on buying the best value in replacement windows with our free guide.